RS232 cable to communicate with PC. 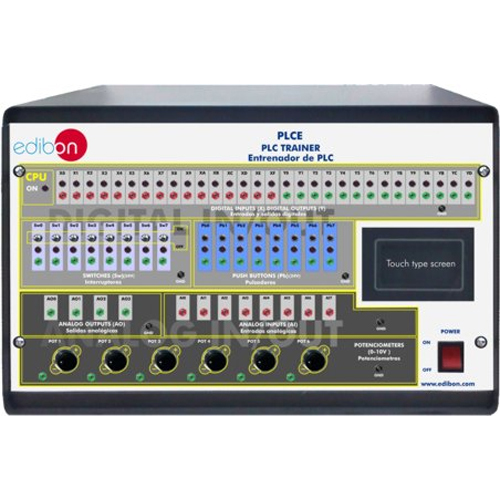 SUB-D connector to communicate with the PLCE applications. Ultra-high processing speed of 0.32 s per instruction. Large Program Capacity of 16 Kstep. Maximum number of I/O points is 300. Inputs: Number of inputs: 16. Voltage: 24Vdc. Outputs: Number of outputs: 14. Output type: relay. Output capacity:2A. Inputs: Number: 8. Input Range: 0 to +10V. Outputs: Number: 4. Output Range: -10V to +10V. Resolution: 12bits. 6 Adjustable analog signals: Range: 0 to +10V. Display: STN monochrome LCD Display. Resolution: 128 (W) x 64 (H) dots. Display color: 2. LCD life: Average 50.000 hours. Backlight: 3-color LED backlight (green, red, orange). Different Displayable fonts. Character types: Alphanumeric characters. Number of screens: approx. 160 screens. Part functions: messages, lamps, switches, data, bar graphs, keyboard. Programming software developed according to the standard IEC 61131-3. Ladder Diagram (LD). Structured Text (ST). Instructions List (IL). Sequential Function Chart (SFC). Function Block Diagram (FBD). Remote programming, service, and diagnostics. Powerful debugging and monitoring tools. Supports user created functions and function blocks. Saves project files inside the PLC. Examples and Quick Start Tutorial included. designed. It allows to transfer the program to the screen, load projects done from the terminal and print screens created. allows to create functional screens adaptable to each application. Drawing Functions: It can be done different programming elements through suitable icons and bitmaps. A library of elements allows to program through the mouse, simply slipping an element and locating it in its place. (Click and Slip). User libraries can be registered and storaged with suitable elements to be used in next projects. It is possible to visualize a preliminary view. It is also possible to select the screens or configurations to be printed. from images can be easily made. Manuals: This unit is supplied with several manuals: Required Services, Assembly and Installation, Interface and Control Software, Startingup, Safety, Maintenance, Calibration, Practices Manuals, PLC Programming Software & PLC Touch Screen Programming Software Manuals. 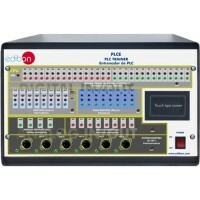 Electrical supply: single-phase, 220V. 50Hz or 110V. 60Hz. Computer (PC), with a serial port free. Dimensions: 490 x 330 x 310 mm. approx.